NIST has multiple test beds to conduct rigorous, transparent and replicable testing of theories, tools and technologies. Below is a list of some of those facilities. FACT is a state-of-the-art laboratory recently commissioned with support from the U.S. Department of Energy's Advanced Research Projects Agency-Energy (ARPA-E) to address the challenges inherent to measuring gas and vapor sorption properties. FACT supports programs developing adsorbents and serves the sorbent materials research community by providing impartial testing and characterization of material sorption properties, establishing testing procedures, and disseminating reliable sorbent material property data and measurement best practices. The NIST manufacturing robotics test bed consists of several labs located in three buildings on the main NIST campus. Combined, these serve as a resource for research in robotics for advanced manufacturing and material handling. 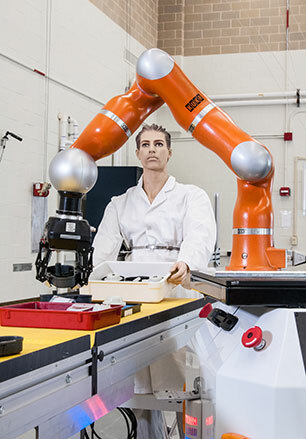 The test bed contains representative state-of-the-art manufacturing robots, including ones that have been designed specifically for safe interactions with human workers in shared environments. The testbed also includes advanced multi-fingered grippers, sensors, conveyors, and an industrial robot arm that can be mounted on a linear rail or on a pedestal. The National Fire Research Laboratory (NFRL) is a facility that enables large scale fire research in the areas of advanced firefighting technologies, engineered fire safety, materials flammability reduction and wildland ­urban interface fire. With the completion of significant facility expansion and upgrades, NFRL is now the only facility in the world that allows scientists and engineers to conduct research on the response of real ­scale structural systems to realistic fire and mechanical loading under controlled laboratory conditions. The National Software Research Library has a research computing environment containing over 40,000,000 unique original files derived from over 20,000 software packages and 15,000 mobile apps. The database contains metadata including filename, byte size, file path, etc. The testbed is not publicly accessible. In order to use the testbed, software must be submitted to the NSRL. The NSRL team can run your job against the file collection, returning the results and your code to you upon completion. NCAL works to develop the measurement methodology, standards and analysis necessary for the U.S. auto industry and base metal suppliers to transition to advanced lightweight materials for auto body components without wasteful trial-and-error development cycles, and successfully transfer this technology to customers in industry. The Industrial Wireless Systems (IWS) Testbed integrates existing and emerging wireless technologies with live physical systems found in factories of all types. The testbed seeks to recreate the physical systems and the radio frequency (RF) environment creating a framework for conducting measurements and test methods that advance the effectiveness, reliability, and security of industrial wireless deployments in factories. The nSoft Consortium operates in a new model of access for industrial research programs to federally funded research facilities such as the NIST Center for Neutron Research (NCNR). 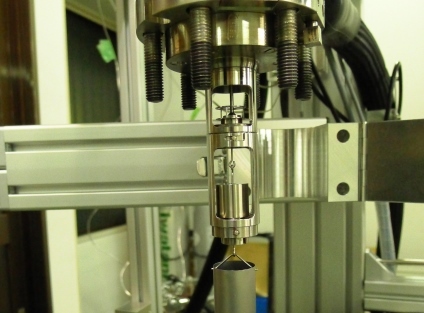 This model is being applied to collaboratively develop neutron-based measurement solutions for manufacturers of soft materials. The PSCR laboratories provide research, development, testing, and evaluation to foster nationwide communications interoperability. Drawing on critical requirements provided by public safety practitioners, the PSCR program provides insight to wireline and wireless standards committees developing standards for voice, data, image, and video communications. Located on the NIST Gaithersburg campus, the Robotics Test Facility – also known as Building 207 – is a laboratory for developing standard methods of measuring robot performance. The facility houses artifacts and equipment for measuring how well robots perform under a variety of tasks that abstract real-world challenges. The application domains supported by this facility include urban search and rescue, bomb-disposal, military ground operations, and manufacturing. The goal of the Smart Manufacturing Systems (SMS) Test Bed is to extend existing production-focused concepts by designing and architecting a test bed that enables smart manufacturing research and development across the product lifecycle. This process should highlight the challenges and requirements for introducing cyber-physical infrastructure in manufacturing, as well as create opportunities to provide a tangible source of data that other researchers may use to develop and validate smart manufacturing technologies.